What a title! 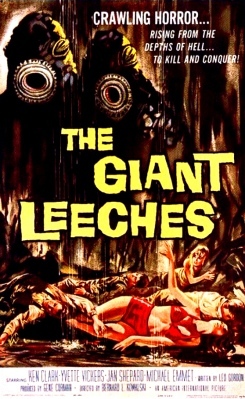 For that reason alone, it’s worth checking out Attack of the Giant Leeches. This is a Corman production, but not Roger. No, it’s the other Corman brother (from the same mother). And that’s Gene Corman. Rising from the depths of hell, to kill and conquer. And all because of NASA space launches from Florida? Well, that certainly counts as a unique deus ex machina. A game warden is tasked to figure out what’s going on as several of the Everglades townsfolk go missing. And the local saloon owner is involved in a tempestuous relationship with his wife, Liz. She cheats on him with one of the bar flies, why? To pad the running, an already spare 61 minutes or so. But what mmore do you need? You got nature run amok blood sucking creatures. There’s not much too this flick. It’s a 1950s creature feature. 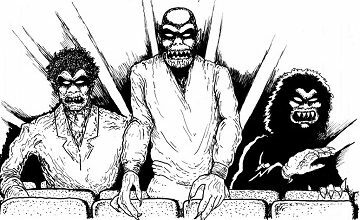 So that means threadbare craptacular effects and some cornball acting and the rest…is well worth watching. Join us for this episode of the podcast and subscribe!